All India Institute of Medical Sciences(AIIMS),New Delhi,Admission, Courses, Fees, Photos and Campus Video, Review, Ranking Details. Creating a country imbued with a scientific culture was Jawaharlal Nehru's dream, and immediately after independence he prepared a grand design to achieve it. Among the temples of modern India which he designed, was a centre of excellence in the medical sciences. Nehru's dream was that such a centre would set the pace for medical education and research in Southeast Asia , and in this he had the wholehearted support of his Health Minister, Rajkumari Amrit Kaur. The health survey and development committee ,chaired by Sir Joseph Bhore, an Indian Civil Servant ,had in 1946 already recommended the establishment of a national medical centre which would concentrate on meeting the need for highly qualified manpower to look after the nation's expanding health care activities . The dreams of Nehru and Amrit Kaur and the recommendations of the Bhore Committee converged to create a proposal which found favor with the government of New Zealand. 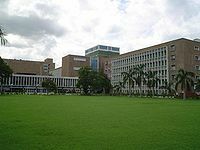 A generous grant from New Zealand under the Colombo Plan made it possible to lay the foundation stone of All India Institute of Medical Sciences (AIIMS) in 1952.The AIIMS was finally created in 1956,as an autonomous institution through an Act of Parliament ,to serve as a nucleus for nurturing excellence in all aspect of health care. Twenty-five clinical departments including four super specialty centers manage practically all types of disease conditions with support from pre- and Para-clinical departments. However, burn cases, dog-bite cases and patients suffering from infectious diseases are not entertained in the AIIMS Hospital. AIIMS also manages a 60-beded hospital in the Comprehensive Rural Health Centre at Ballabgarh in Haryana and provides health cover to about 2.5 lakh population through the Centre for Community Medicine. 1. "Prof. N. R. Jagannathan , Head of the Department of NMR and MRI Facility, AIIMS was honored recently by the International Society for Magnetic Resonance in Medicine ( ISMRM), by electing him as Fellow of the Society that has over 6000 members around the globe with head quarters in USA. The award was presented to Dr. Jagannathan on May 3rd, 2010 at Stockholm, Sweden by the President of the Society in the presence of Queen of Sweden. Prof. Jagannathan is the first scientist from the Asia/sub-continent to be elected as Fellow of ISMRM for his contribution to the magnetic resonance imaging and spectroscopic studies on breast cancer and service to the ISMRM "
2. Sumit Isharwal and Shubham Gupta, AIIMS Students have been awarded the prestigious Texas Heart Institute Journal prize for undergraduate writing on history of cardiac surgery. This is the second time in the last eight years that AIIMS Students have won this prize. Their manuscript on Dr. Rustom Jal Vakil will be published in the Texas Heart Institute Journal in due course.